Yeah, yeah I'm hopping onto names and keep changing my blog address and look: I'm unruly and confused. 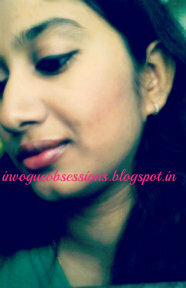 I started with a Beauty blog concentrating more on Product reviews and bam! I have no time to put a product to test and analyse every detail about it, I mean I'm into testing them but analysing from every aspect, not my niché. I cannot manage with my PG and two other (Poetry/Creative writing) blogs. Though I've made my mind to keep this space,atleast use it for Photography, Hauls, Giveaways, D-I-Y and maybe I'll do some OOTDs, FOTD's and EOTDs and to share my OBSESSIONS. But I will be up with a Review/ Swatch or Post without any of the mentioned above, with a Theme post on Newbie Beauty Blogger Network. Maybe someday I'll be Obsessed with this space too. I've to takecare of few things now, right away! And and and...Idée Fixe is pronounced as [ee day feeks] No, I'm not getting into phonetics now. To know more about me: About The Obsessionist.